Life is a Story Problem LLC sponsors a number of books on math subjects. Purchasing these books helps support the goals of the organization. Concise: Definitions are compact, yet understandable. Complete: All words and phrases of interest to students of the target classes are included, plus a few just beyond the scope of the target classes. Tables of symbols and notation, formulas, and units of measurement, plus lists of properties of objects give the student all the information needed to understand the concepts and decipher many word problems. Correct: The definitions have been thoroughly reviewed for mathematical correctness. Comprehensible: The definitions are written to be understood by students in the target classes. Abundant illustrations aid in understanding. One of the difficulties many students experience in learning math skills has to do with the fact that an entire language has grown up around math. Students that acquire that language are successful in math studies. Students that do not acquire that language have serious problems with mathematics. Numbers tell us how many, how long, how far. We can tell how much by counting. There are small numbers and large numbers. Nothing has a number - zero. Numbers can be written with digits or letters. Numbers help us understand our world. Numbers is one of a planned series of books that increase math literacy of primary school students. Introducing students to the words and concepts of mathematics increases their ability to understand the principles of math. Children just love mind expanding experiences. And there is nothing more mind expanding than infinity. In this unrestrained look at infinity, children learn that there is something bigger than anything. That something is infinity. Since the Mandelbrot set was discovered, probably by Benoit B. Mandelbrot in 1979, many beautiful and often times bizarre fractal pictures have been created. Here is a book of some of my high-resolution favorites. David McAdams made a successful career in software development for 35 years. Then, bored with computer programming, he turned his attention to how children learn mathematics. His books are the result of this effort. Swing Sets uses childrens' natural ability to classify objects to introduce the concept of a set and membership in a set. Sets are fundamental to modern mathematics. Every principle of number theory, arithmetic, algebra, geometry, trigonometry and calculus is defined in terms of sets. An early understanding of the principles, language and notation of sets will prepare a child to absorb higher math concepts quickly and thoroughly. A definition of a set is: A collection of objects where it is known if any particular object is a member of the set. A collection is any grouping. An object can be anything; a toy, a number, or even another set. Membership is a critical concept here. To form a set, one must be able to tell exactly what is in the set and what is not in the set. Each set must be clearly defined. This book starts with a definition for the types of objects that can be included in a set and a definition for each set. A swing set is a group of swings that hang from the same pole. A swing is something that swings back and forth that kids can ride on. This definition is emphasized throughout the book. As you discuss this book with your child, emphasize the definitions given and whether objects not found in the book meets the definitions. This book teaches the child how to form a math statement such as f is an element of B from a situation involving sets. This book also teaches the child how to translate a math statement expressing membership in a set into words. As a professional math teacher, Mr. McAdams quickly realized that math literacy of high school students could be improved by an increased focus on the acquisition of math vocabulary. However, he found that math vocabulary resources were sadly deficient. Committed to improving the math teaching environment, he has spent many years developing this math literacy tools for children and teenagers. Swing Sets is his third contribution for young readers. Pi to One Million Digits contains the first million digits of the value of pi. Pi, the ratio of the circumference of a circle to its diameter, has been know to exist for thousands of years. Even before the common era, ancient mathematicians had found approximations for pi that were accurate to two digits (3.1). The Babylonians used 25/8 as an approximation of pi. The ancient Egyptians used 16/9 squared for pi. The next to improve the approximations for pi were Chinese mathematicians. The Chinese approximation was correct to seven digits (3.141592). In Greece, Archimedes used a polygon draw outside a circle, and a polygon drawn inside a circle, and extended pi to three digits (3.14). Finally, when infinite series were developed, one could calculate pi with pen and paper to as many digits as one had time for. It was not until computers came along that it was practical to calculate pi to a million digits. Here, in this book, are the results. Pi to One Million Digits can be used to wow students, to give a visual example of one million, as a pseudo-random number list, or as a thoughtful gift for the mathematician or math teacher in your life. A geometric net is a flat drawing that can be cut and folded into a three dimensional figure. For example, six identical squares can be made into a cube. This is because a cube has six sides, all of which are identical squares. Each of the drawings in this book can be cut and folded into a three dimensional geometric object. Geometric nets provide many hours of fascinating fun! Each net represents the surface of a unique geometric shape. Some of the shapes were described as much as 2500 years ago. As a professional math teacher, Mr. McAdams quickly realized that affordable tools for math literacy were sadly deficient. Committed to improving the math learning environment, he has spent many years developing math literacy tools such as this project book. There are two different project books available: Geometric Nets Project Book with 80 geometric nets, untabbed; Geometric Nets Mega Project Book Tabbed, with 253 geometric nets, all tabbed for easier construction." Understanding the concepts of orders of numbers is key to understanding physics and other sciences which often use large numbers. The book Orders of Ten is a visual reference helping students grasp the meaning of large numbers. The first page starts with one dot, then ten, then one hundred dots, on up to one million dots. Applications of Algebra Dealing with Automobiles (1915) by Thirmuthis Brookman, et. al. 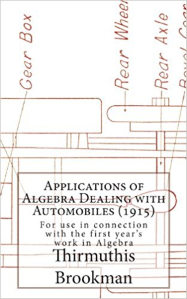 This reprint of the classic work, originally published in 1913, uses automobiles to demonstrate principles of algebra. It contains problems on equations, ratios and other matters important to algebra (and to automobiles). 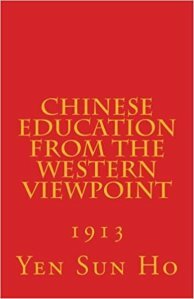 From the introduction: The following pages contain a general survey of the educational development of China up to 1913. The occidental students of educational history generally have a hazy and in­adequate idea of what the term "Chinese education" really connotes. Some speak of the examination system, which forms but a link in the whole chain of the educational development of China, as though it constituted the whole history of Chinese education. While it is true that old Chinese education since the founding of the Appointment System had been of a humanistic type, it does not follow, as Professor Monroe dogmat­ically asserts, that Chinese literature is so inferior to the occidental classical literature that "when the general results upon intellectual life and social develop­ment are considered, there is little basis for comparison." 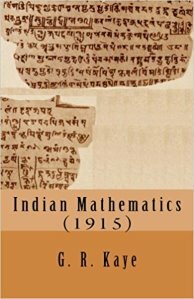 "Indian Mathematics" is a classic text on the history of mathematics in India. It clarifies the contributions of Hindu mathematicians and traces the exchange of mathematical ideas in the ancient world. Note: While this is an important mathematical publication, it does contain racial stereotypes popular at the time.